Pay by cash, check, money order, debit card, or credit card (Visa, Mastercard, or Discover) Mon-Thu 8am-5pm at our office. Pay anytime by personal check or money order using our payment drop box located outside the office door. Please do not drop cash. Call us at (360) 734-9224 during business hours to pay by debit or credit card (Visa, Mastercard, or Discover). We have partnered with Xpress Bill Pay. You can pay your bills with a credit or debit card (Visa, Discover, MasterCard) or you can transfer funds directly from your checking account. If you would like, you can select the Auto Pay option and your bill will be paid automatically each month utilizing your credit or debit card or checking account. For assistance with your Xpress Bill Pay account, please call 1 (800) 766-2350 or visit their site. Along with being able to make a payment online at any time, you can also call the Xpress Bill Pay Interactive Voice Response System to make a payment over the phone at 1 (866) 212-7365. All payments are required to be made in US Funds only. Fees apply to all types of returned payments including NSF checks. The total balance is due with each billing cycle. A late charge of 10% is applied onto any remaining portion not paid by the due date. If you have any questions, please contact us. 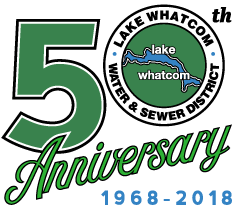 Changes to your billing preferences may be submitted with your next payment or through our office at (360) 734-9224, Monday through Thursday, 8:00 am to 5:00 pm. If you are looking for information about water bills and accounts for renters, please visit the rental properties page.